The Reuben Sandwich is a grilled or toasted sandwich made with corned beef, sauerkraut, Swiss cheese, and either Russian dressing or Thousand Island dressing. It is often made with rye bread, but originally it may have been served on pumpernickel bread. This is another one of those disputed recipes regarding its origins. Some say that the sandwich is New York's greatest contribution to the culinary world. There is one thing wrong with that statement. Although the Reuben sandwich is absolutely delicious, I think New York has other food creations that might be considered equally important. 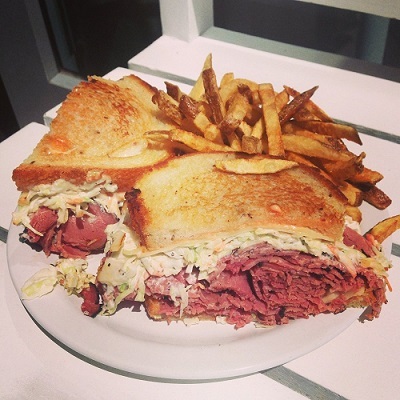 Was the Reuben invented in New York? Descendants of Arnold Reuben, the owner of the Reuben Restaurant on 58th Street in New York City, claim he was the creator of the sandwich. 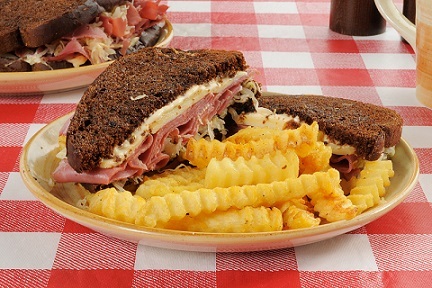 But few other things make an Omaha resident madder than to hear that the Reuben sandwich was invented in New York City. Everyone in that state says Reuben Kulakofsky, an owner of Omaha's Central Market, created the Reuben back in the 1920s. Since my restaurant guests and I love a delicious Reuben, and because I am not living in Nebraska or New York, I can just say "thanks" to whomever actually invented it and then provide you with the original recipe that is made for my guests, at home on occasion, and at the restaurant fairly frequently. 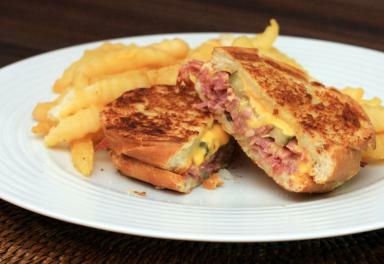 There are variations with The Reuben, including a sister sandwich, the "Rachel," which itself varies regionally. The most popular recipe I know for the Rachel is made with pastrami instead of corned beef (and sometimes coleslaw instead of sauerkraut), and that recipe is shown below. A Georgia Reuben is made with slice turkey and coleslaw. Preparation time: 10 minutes if ingredients are ready and at hand. Makes one sandwich. That's it! How about Reuben's sister? Preparation: 10 minutes. Serves 1. Enjoy your Reuben Sandwich or the Rachael Sandwich, whichever one you prefer to make, and the company of those you share it with! Did you know? “Reuben and Rachel” is a traditional song written by Harry Birch and William Gooch, originally published in Boston in 1871.